Overall 9.2/10 ... Watch this if you are a Blame! fan, just don't watch it with the intent of getting the same experience you got from the manga. While not being entirely true to the original story, I can't really complain. This was spectacular... The music, the sounds, how everything looked, it was all so cool! I'm sure if you're one of those super picky fans that rip anything that's not exactly the original story you will find a lot of things to complain about. Also I know lots of people are not fans of the 3D art style. Quite frankly I think it fits it well. EDIT: If you have never read Blame! I would actually recommend you to watch this... Then if you think it is cool, read the manga! TL;DR: Terminator meets AJIN studio. It's a mindless action flick with mediocre CGI and bland characters stuck in a subpar story but the music is atleast nice? If you are thinking the Blame! movie is a post-apocalyptic sci-fi action flick where humanity tries to blame the culprit that led to their society's demise, well you can't be more wrong. It's merely a plot hole filled story about a group of villagers, Electro-Fishers, trying to survive in this post-apocalyptic world where technology has deemed humans as contaminants due to lack of Net Terminal Gene therefore must be eliminated. Cue in Killy, this strange emotionless robot human cyborg (Terminator) trying to find a human with this Net Terminal Gene to put an end to this chaos and fight against the exterminators. Though the premise might sound interesting, the execution by Hiroyuki Seshita fell flat. There really isn't a story to this anime. It's just characters moving from one location to another. Due to their naivety they land in problems that needs to be resolved. It's understandable that this is testing the water with a different take on the manga adaptation, hence how much the story is open ended. However, leaving something too open results in a hollow experience overall. That's what happened watching this anime. Some action sequences were good. Some issues made sense. However, viewers won't feel attached to the story and at times would even fast forward because how boring and stale the universe became. If the story wasn't stale enough, the characters made it even worse. Apart from the MC Killy, this Terminator-esque emotionless robot, all the other characters are just placeholders that can be replaced at any time. Which is exactly what happened as the movie progresses. You never feel anything for the people that dies in this movie. If there is one word that can sum up their deaths, it's "meh." The characters don't really have a backstory or purpose and lack severe character development. They just exist because they exist. Except Killy, he is pretty badass. Regardless of the movie's failure in substantial plot and concrete character development, the art and sound were sort of its saving grace. The CGI animation, though in 10fps, still felt nice after you get used it. The landscape is vibrant with bold colours and the cinematography is quite beautiful. Not to mention, the redesigned Killy with the rugged features really added to his character. They gave Zuru kawaii features to turn her into an eye candy but failed to give other characters distinguishable features to make them stand out. Despite that, the action sequences with the background score, gave it a nice cozy feel and let you somewhat feel the catastrophic dilemma the people are trapped inside this post-apocalyptic run down world ruled by watchtowers (Skynet). The OST is definitely worth listening to on its own. 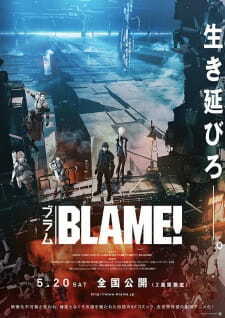 Overall, the movie is fun to watch for fans of the Blame! manga/anime or for anyone who just loves to watch a mindless action flick. The director left the ending open ended so one can assume if this movie receives positive buzz more installments in this franchise are to come in the near future. So if you can get over its subpar plot and confounding character development, give it a watch. Tell me later how you like it! P.S. Thank you for reading. I hope you found this short and supaishi review helpful! P.P.S. Blame! is just the Japanese onomatopoeic gun sound *blem*. In 2003, the Blame! manga was adapted into a six-part original network animation by Group TAC, and it was absolutely terrible. Having seen this show many years ago, and hearing nothing but praise for the manga (which I still need to get around to reading) I was more than sceptical to say the least in regards to the movie adaptation, produced by Polygon Pictures (known for their sometimes awkward CGI in the cases of Ajin or Knights of Sidonia) and the fact that it was a film adaptation of a popular manga, which often doesn't go too well. I imagined the series would be as rushed and poorly produced as the Golden Age Berserk Trilogy, but thankfully here, while the characters and narrative aren't exactly as great as it could have been, still manages to provide a great setting for its theme execution while also having pretty good CGI animation. Set in a world in which humans have lost access to all of the world's technology after an event called the "infection" causes all of the machinery to develop multi-levelled structures that repeat infinity creating a huge, never-ending dystopian city in which machines, called the safeguard, kill the humans resulting in only a very small volume of civilisation, tucked away safely in a place in which the safeguard cannot reach. Enter a girl named Zuru, whom, with a group of other young teenagers, venture out into this broken world in hopes of finding food for their starving village. However, things go horribly wrong when the safeguards begin to attack Zuru's group and the exterminators, essentially fast as hell killer robots that run on all four legs, kill most of the members of the group and everyone would have died if it were not for a man, or, better yet, a robot (which the movie never actually explains nor do we learn his backstory) by the name of Killy who uses a big damn laser gun to destroy all of the exterminators in one shot. After this, the group take him back to their village after Killy asks them if they have the Net Terminal Gene which, as we learn later, is a gene in which allows humans to control the robots and take back the cities and the world around them. After Killy speaks to the village elder, whom everyone refers to as 'papa', the elder recalls the term "Net Terminal Gene" and takes Killy down to the lower levels to see if they can find any information about it. While there, Killy finds an old and beaten up android who had been laying dormant for hundreds of years, waiting for someone to come and save her, and, with that, Killy, the android called Cibo, Zuru and the rest of the team, set off on a journey in order to gain the Net Terminal Genes in order to restore balance to the world once again. The narrative surrounding this movie is pretty linear and straightforward but that's fine. I'd rather have a simpler narrative done right than a convoluted one that tries to squeeze everything into the time frame of a film. For starters, it doesn't take too much to feel a sense of empathy between the last surviving humans and their quest for the Net Terminal Genes and the simpler narrative and set-up definitely does help in this regard. Not only that, but the pacing of the film is pretty decently executed. It felt as if it wasn't trying to rush everything into a two hour frame and took its time explaining a few concepts and ideas, although nothing all too substantial as a whole, and that's my biggest gripe with the film. The film format doesn't allow for fully fleshed out characters or backstories and we don't learn anything about Killy in the slightest, or even all too much about Cibo either! We're given really vague and uninteresting backstories to Cibo in particular, but other than her motivation for wanting to take back the city, she feels extremely bland and underdeveloped, and this role also extends to Killy too. I understand they're both robots, and thus lack emotion or character, but they just felt way too underutilised and underdeveloped. The human characters are a bit better but none of them gets any development either. The film does hint as Zeru's anxieties and fears over losing some of her friends while fighting but it never surfaces ever again and lacks development. I could never really feel too attached to these characters, and while, I did feel some tension in some of the action scenes in regards to their life, for the most part, I just didn't care who lived or died. It's pretty obvious that the anime is trying to make you care since there are plenty of emotional scenes with character deaths but it never really felt all too sad to me since I was not attached enough to the character in order for this to have had any effect on me. The film's exposition delivery can also be a little too heavy at times with the main character just telling us the state of the world at the very beginning of the film and I've seen this done so many times before that it ends up leaving no impact on me, and the film does this a couple of other times as well. I believe it would have been more effective if the film opened up with no exposition what so ever and the audience could have seen the state of the world for themselves, it would have been more much more engaging and interesting. However, to be fair, there are a couple of exposition scenes that feel natural and as if they're happening in the world such as when the elder is explaining the customs and history of the village to Killy who had never been there before and thus the audience assumes these characters roles. As we learn about their village, as thus Killy, but this technique is never really utilised all too much in the film. If there is one thing the film does well is its setting and attention to detail. I was so immersed into this world they through me into and I loved the broken down, city dystopia setting and the entire design of the world; it was pretty good. Not only that, but the action and even the GCI were also great. The CGI never came across as jarring or awkward and the action scenes were full of high-level movement and were exciting to boot; I felt the hype, and if that's what the movie was going for it certainly achieved it on that end. In addition, the final action scene was pretty fun to watch from a visual standpoint, but you may find yourself feeling that the ending was a bit anti-climatic since nothing much was actually achieved by the end, and it leaves on quite an annoying cliffhanger, which just makes me want to go and read the manga. The music does the job, but I never found it too be all too great and there were a few scenes that I found to be completely stupid which I would describe in more detail but I don't want to get into spoiler territory. But, despite that, the film is enjoyable and does do a few things right to warrant the praise I gave out in the opening paragraphs. While the characters don't get much development, it is easy to feel a sense of empathy for them, which is more than I can say for other films of this nature, and if you're looking for a fun, action-packed adventure with a great dystopian setting, than I would recommend this. I'll make this as short as possible without entering into every part of the movie. To get the full experience for this movie you HAVE to read the manga to its entirety. This is one of the first major arcs of the Blame! series and the first one. But because they only wanted to make the first arc and not finish the entire story of Blame, they added things, changed things, and made it in a way that could make you think Blame! is only this. If you didn't notice it (this is for the manga readers), this story is set from the village girl POV. That is why they managed to pull of this movie without getting too in-depth with Killy; also the reason why Killy barely talked and we didn't get to hear his thought process and why we got to see more of the villagers when in the manga they barely even matter enough to remember their names. Overall, if you want to start reading the manga, this movie could very well tell you if you should read it or not. This is a great starting point for anyone wanting to get a feel of what Nihei's work is like. I love all of Polygon Picture's works because of their great use of CGI compared to other studios, which made justice for a work that could only work with a background made with great detail which showed how inmense the Blame! world is like. Also, if you can speed up the movie to around x1.25 to x1.5 then it would look and feel even better because they talk slowly and some scenes drag for more than necesarry. PD: Watched this on Netflix (available since the 05/19) so I couldn't use VLC Player to speed up the movie so I wouldn't know if speeding up the movie could feel better. Which is better dub or sub version of the movie?